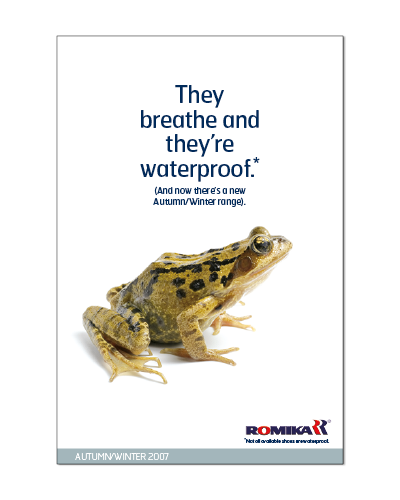 When the UK distributor of German footwear brand Romika briefed us to create in-store support materials for the launch of a new autumn active outdoor range, we collectively agreed that the proposition had to be simply that they kept your feet dry and they allowed your feet to breathe. 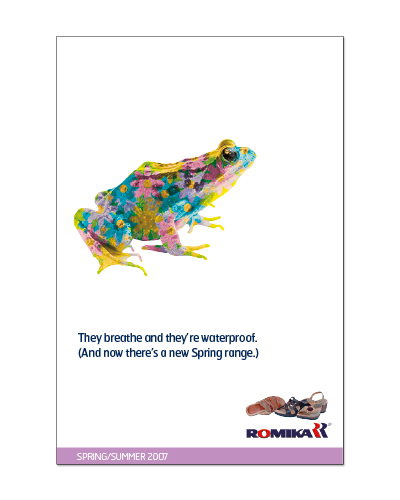 Benefits like comfort and durability were a given as Romika footwear were a popular repeat purchase within their specific market segment. There’s a proliferation of big pictures of shoes or lifestyle images in shoe retailing. Combine that with small independent stores being pushed for display space, store managers often opt not to use what they see as me-too materials. To cut through this we opted for a literal but lateral interpretation of ‘they breath and they’re waterproof’ by using images of creatures with those properties. Nothing at all to do with shoes, but everything to do with delivering simplicity and engagement in a poster. The client was brave enough to go with it and the majority of stockists used all the kit we supplied as they saw it as something different and fun. 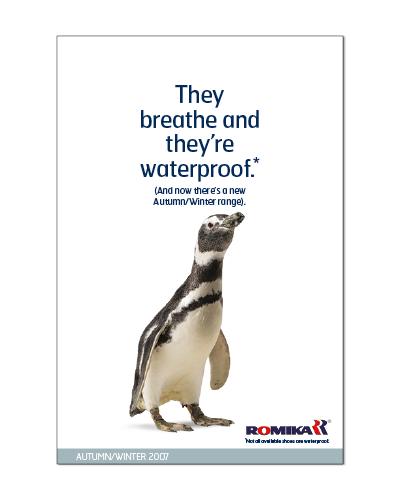 Unfortunately the budget wouldn’t stretch to our suggestion of extra-large cutout A-board penguins outside each stockist. The images became the carrier for the campaign the following season where they had a bright spring make over. 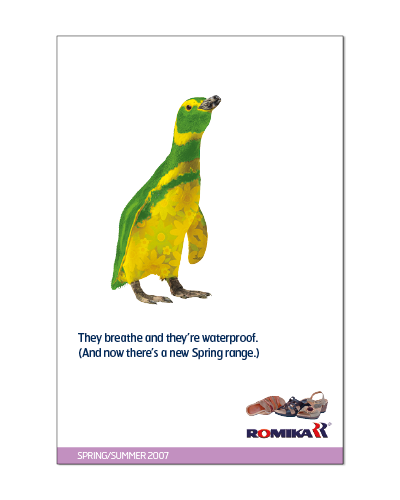 We think it’s probably the first time a floral-pattern penguin has sold shoes.